Quality - Oak Ridge Tool-Engineering, Inc.
Technicians use a state-of-the-art laser tracking system to align critical space station components for assembly in ORT-E's certified clean room. 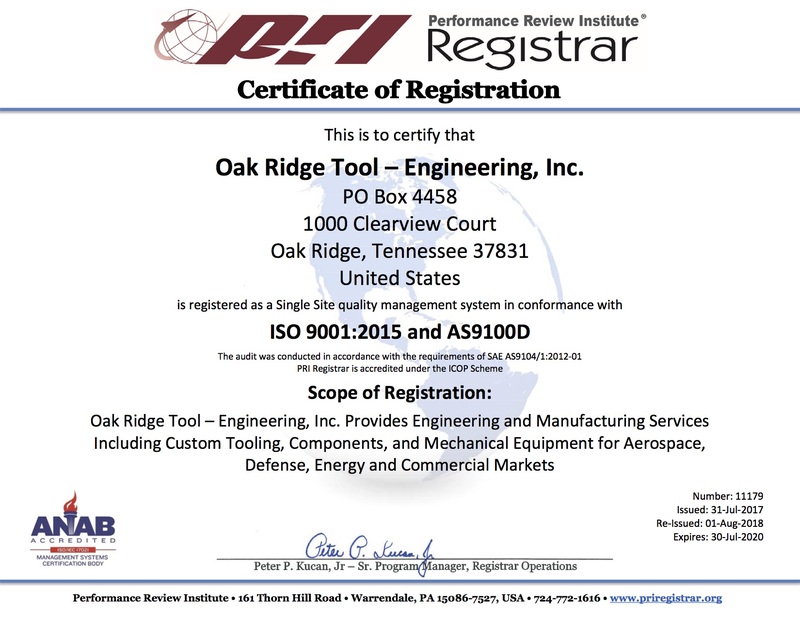 The ORT-E team continually improves its manufacturing processes and product quality and takes pride in following the latest Quality Assurance procedures for engineering, purchasing, manufacturing, inspection, and testing according to aerospace/defense, nuclear, and international codes and standards. Certified by Performance Review Institute (PRI), ORT-E believes a cost-effective approach adds value for its customers. The Oak Ridge headquarters represents a complete high-tech operation that is ready to meet and exceed the needs of its diverse customers. 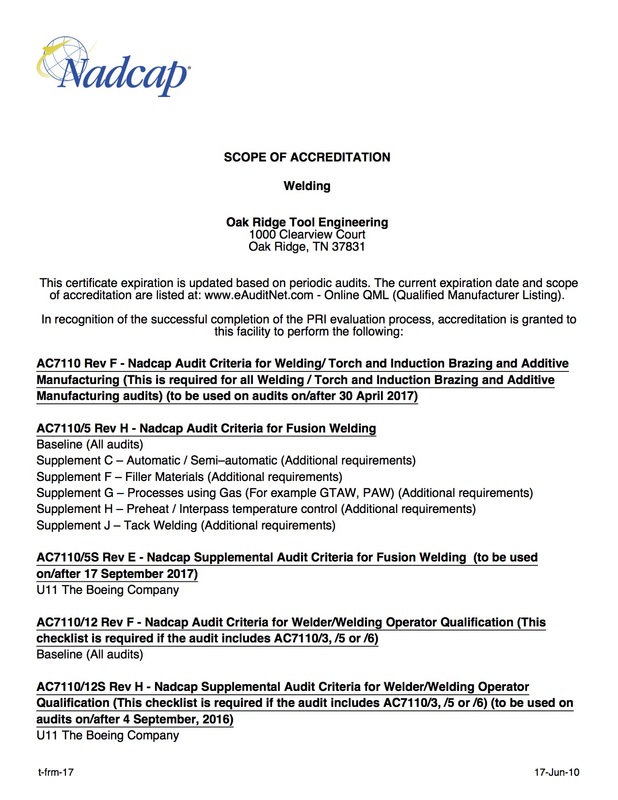 ORT-E inspects, tests, and maintains equipment, in conformance with strict standards, to ensure and substantiate product conformance to drawings, specifications and contract requirements. ORT-E's modern, multi-axis CNC machines allow the company's highly trained professionals to perform tasks once thought to be impossible. Whether producing farm implements for John Deere or crafting highly sophisticated hardware for Boeing's International Space Station, ORT-E has consistently proven to be the national and international industry leader when quality, precision, quick turnaround, and competitive pricing are required. ORT-E stands alone at the highest level of precision tooling, machining, fabrication, and engineering. No other company can match its record of international achievement, high-tech capabilities, superior quality, or its concept-to-completion approach. 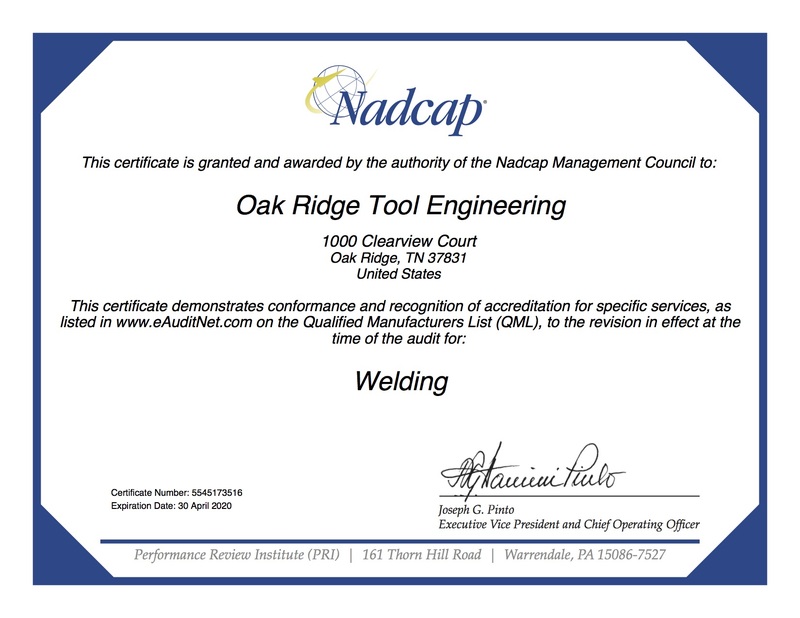 When your needs require the best, contact the team at Oak Ridge Tool-Engineering – setting the standard for excellence. ORT-E's 120 inch Cincinnati Gilbert with 1997 4-axis Fagor CNC Control, one of the company's large-capacity multi-axis CNC boring mills, represents the wide range of capabilities crucial to ORT-E's continued success in the world marketplace. If the project meets the standards of excellence set by ORT-E, you can be assured it is the best in the business. Using the ISO 9001:2008 standard, ORT-E takes a systematic approach to managing its organizational processes to consistently turn out products that satisfy customers' expectations. ORT-E's client list reads like a who's who of American and international industries. Many of ORT-E's customers demand prototype-machining and R & D.